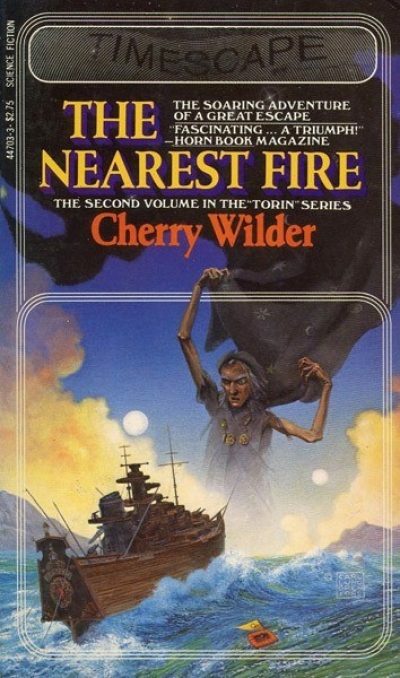 1980’s The Nearest Fire is the second volume in Cherry Wilder’s Torin series. Yolo Harn is principled and inflexible. Her righteous fury leads to an angry assault, a crime Yolo will regret for the rest of her life. Regardless of her motivation, assault is assault. Nothing for it but to send her off to prison. Offered a poisoned amnesty, one that would trade a jail term for lifelong vassalage, Yolo sticks to her principles and declines the offer. Affronted, officials send Yolo away, to serve out her term in distant Itsik, the worst prison colony on Torin. That act of spite places Torin’s destiny in Yolo’s hands. Temper and inflexible principles aside, Yolo has many endearing qualities. She soon makes friends and allies within the prison bureaucracy. Unfortunately, that does not make life at the prison much safer or more pleasant. The prospect of spending years at Itsik is unappealing. Small surprise that Yolo’s thoughts turn to escape. But life as a fugitive would present its own challenges, so Yolo defers action. Her hand is forced by the arrival of Tsorl-U-Tsorl, former Deputy of Tsagul. Cast out of office on trumped-up charges, Tsorl-U-Tsorl arrives in bad health; he also faces a possible death sentence. Affronted by official mistreatment of a man whom her foster-father revered, Yolo orchestrates escape from Itsik for herself and Tsorl-U-Tsorl. The escape is dangerous; at best, the two will end up on distant and forbidding Tsabeggan, a desolate volcanic island populated by hostile natives. Or they could die at sea. Still, escape with a chance of death is better than imprisonment and imminent death (for Tsorl-U-Tsorl at least). What the escapees do not know is that Tsabeggan has acquired some new inhabitants: Torin’s very first extra-Torinian visitors. Visitors from the stars. Yolo makes friends with the visitors and even learns their language. She may have lost her place in Torinian society, but on Tsabeggan she finds a new one. Thanks to the lone human castaway whose adventures were detailed in The Luck of Brin’s Five, Torin’s rulers are well aware that off-world humans have discovered their world. The question is how best to manage contact to avoid catastrophic disruption. Sign treaties with the off-worlders? Ignore them? Lure them into an ambush and kill them out of hand? Yolo’s background has hardly prepared her to serve as interstellar diplomat and yet that’s the very role that fate seems to have chosen for her. A steadfast embrace of principle, consequences be damned … just the thing one needs for successful diplomacy. Yolo is well supplied with intransigence. The results make for an exciting narrative. I don’t know if I am reading more into the text than the author intended, but I began to wonder if Torin’s rulers are so cautious about high technology because they had it at one point (and learned to rue their tools). Bits of Torinian technology seem oddly advanced. Although I suppose Earth would look like an odd mix of basic and advanced technology to a visitor. Many SF authors opt for aliens who are essentially the same as humans, save for the odd pair of rubber ears or nose appliances. Wilder has selected a different model for her Torinians. Torinians, for example, are marsupials, which makes birth considerably less dangerous for them. Another major difference between humans and Torinians is that while human gender differences are usually set at birth, Torinians are more plastic. Ingestion of the right herbs in the right quantity can shape growth. Torinian society features a caste of women who have chosen to become both sterile and unusually strong. Unlike most first contact stories, this narrative is recounted from a non-human perspective. What humans take as perfectly normal seems odd — even terrifying (bloody, painful human birth, as witnessed by Yolo). The prospect of co-existence with interstellar visitors (or possibly invaders) may or may not be good for Torin . What may save the humans from an ignominious end is a pervading feature of Torin society: family is more a matter of choice than of blood. Even the bizarre visitors can be adopted into a clan. I could not help but compare this series to Cherryh’s Chanur series, which also features first contact with isolated humans as told from the alien point of view. Wilder’s setting can be dangerous to humans, but, on the whole, Torin appears a much safer place for stray humans than Cherryh’s Compact Space. If you enjoyed the Chanur novels (or didn’t, but found the central idea intriguing), and you do like stories about people forging bonds across differences, consider this series. As far as I can tell, The Nearest Fire is out of print. Re 1, that seems a recurring theme for most rulers. I don't see any entry for "Cherry Wildwe" in Revews by author. Unfortunately, the rest of the Torin trilogy did not get e-booked when the Hylor books and the first Torin book were. I'll have to see if I can dig up an old paperback copy.